AMA Supercross Championship favourite Chad Reed bounced back from two weeks of troubles to take his first win at Indianapolis, while Trey Canard has still to be defeated in the Lites class - at Hawkstone, Styla and the Hoover clean up. 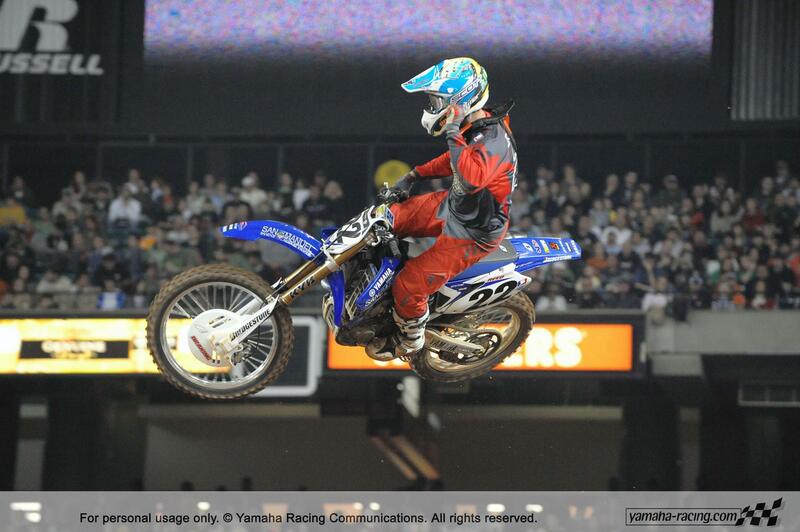 Yamaha’s Thunder from Down Under pulled the hole shot ahead of Andrew Short, Davi Millsaps, Ryan Dungey and Kevin Windham. Kevin Windham, also known as K-Dub, made quick work of Dungey in the Makita Suzuki youngster’s first 450 Supercross, followed swiftly through by Josh Hill, but then Hill bobbled, allowing Dungey to recover the spot. Windham was on it up front, catching and passing Davi Millsaps before the end of lap three, and setting his sights on Short even as Shorty was making a decent fist of keeping Reed honest. As the race neared the halfway point, a subtle shift occurred – Kevin Windham slowly began reversing back down the field he’d just passed, whilst Davi Millsaps and Josh Hill managed to pass Andrew Short and Ryan Dungey respectively. Up front however, Chad Reed was just gone, and even the interventions of the lappers couldn’t prevent him from taking the win and extending his points lead - behind him, however, Millsaps was to crash out whilst the impressive Hill made a successful pass on Short to seal second place. Pro Circuit’s temperamental veteran Brandon Jesseman got the hole shot in the Lites class, but it was the seemingly-unbeatable Trey Canard who swiftly blasted into the lead. Ryan Villopoto also blitzed Jesseman, and began to charge after Canard, desperate to put some points on the board after his disappointing season opener at Atlanta, went behind Jesseman. Rookie Nico Izzi settled in ahead of Ben Townley’s French Red Bull Honda substitute, Benjamin Coisy. Up front, the indomitable Ryan Villopoto closed Trey Canard down, but when it came to putting the move on, the normally-unflappable youngster ran inside too hot, running into Canard’s Honda and putting them both down. Villopoto took a little while to get going, but only Brandon Jesseman got past Canard as he picked his still-running bike up, and the rookie was soon right on the back tyre of Jesseman‘s Kawasaki. Within a lap, Jesseman had succumbed to the pressure and stalled, gifting the lead to Trey Canard and allowing Nico Izzi and Benjamin Coisy to sneak past, too. Villopoto recovered and put on a charge, making his way back into second on the last lap to give him a slim shot at the East Coast title as Canard cantered home.